For over 40 year my bumming around the woods was a 44 mag. Redhawk. Since I got a Marlin 1894 cowboy, in 44 mag. about 7 years ago; it goes along for the journey. I love the idea of two firearms one cartridge. 10 in the rifle and 6 in the revolver at my disposal with no reloading. Mag loads in the revolver and a few cowboy loads first , 3 or so, in the rifle to shoot at the deadly pinecone or assault rock, if it attacks. Unless I am hunting, I just enjoy plinking when I am out there. It is better than being in church, I feel His presence more there! Those two, or an 1894 and Redhawk in 45 Colt, are the "TWO MOST ESSENTIAL FIREARMS EVER" in my book. Yeah you 'need' a 22 LR, a shotgun, a long-distance pointy-bullet-shooter, and some kind of a salt-weapon, but if you only had two guns, let them be a Marlin 1894 and Redhawk....!!!!! 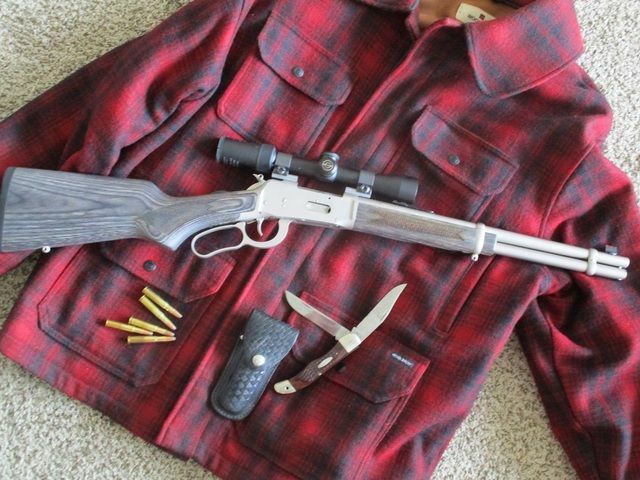 I generally carry the 95 Marlin cowboy 45-70 on woods walks. That's cuz you live up near the North Pole where there's bars and wolfs and all them big scary things, plus if you get a broke leg out there in the blizzards, you have enough powder in one o them 45-70 cartridges to light a whole tree on fire and get warm....! Last edited by AJMD429 on Fri Jan 25, 2019 7:24 pm, edited 3 times in total. Those two, or an 1895 and Redhawk in 45 Colt, are the "TWO MOST ESSENTIAL FIREARMS EVER" in my book. Yeah you 'need' a 22 LR, a shotgun, a long-distance pointy-bullet-shooter, but if you only had two guns, let them be a Marlin 1894 and Redhawk....!!!!! Or if you are up to yer neck in snow just point that 45-70 at the ground and the recoil will lift ya up and out! Thanks 1894. I said it needed it, didn’t say I don’t have five or six bullseyes in the parts box. My big issue wasn’t the parts it was the “round tuit” that seems to have been the issue. 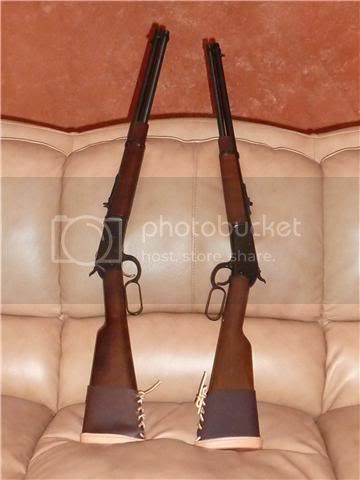 Nice clean Marlin otteray......it's getting harder and harder to find used but not abused old leverguns...nice early Smith hand ejectors too......were they resighted? Yes, resighted. The the 3rd Change model has a 'Wonder Sight' added; the 4th Change model has an adjustable sight mounted in the top strap, and it is very accurate! stainless guide gun lobbing 525gr hard cast tc at 1425 fps . . . .
still haven't run into any bums in the woods though . . .
My strolling thru the woods for the most part is confined to putting around on my Kawasaki 750 Brute Force , so that being the case if I am so inclined to transport a rifle with me more then likely it'll be a Mannlicher Schoenauer MCA Carbine in 243 WIN OR a Ruger #3 Carbine that started life as a 44 MAG and sometime before I got it was rechambered to 444 Marlin . Both those deer were from this past season by the way . Now with all that being said I'd have to give some consideration to my AR Grendel and my Howa Grendel . A few years back I had the perfect thing if I was only able to walk thru my own woods , had a Marlin Model 1892 and a Marlin Model 92 and both were 32 cal. They were capable of shooting 32 rimfire if you could find any and 32 Short Colt and 32 Long Colt with the mere change of the firing pin which takes about 30 seconds . I really enjhoyed those two once I got a heel bullet mold and 200 brand new Long Colt cases from a dealer off 81 just south of the New York state line and of course the dies from CH-4D . Pete nice choice of a combo gun, these folders are fast to deploy and two triggers means no mucking about with selectors. I got the Chiappa DB in 22LR/410 , had some issues with misfires which are now sorted. The 410 is underated for walking, 22cal is no charge stopper but 410ga with 5x 000 buck is 3/4 of 12 ga load. Last edited by mickbr on Sat Jan 26, 2019 3:33 am, edited 1 time in total. I have a 357 model 92 Rossi and a 44 mag browning 92. They look identical except for the gold trigger on the browning. I prefer the 357. It`s a sweetheart to shoot and the 44 is a kicker. The 357 is far more practicable except for grizzley and even then I doubt it would make much difference. I would prefer it in .256 win mag if someone would make one. I don't really woods walk anymore, this fat old man rides a RZR so I could haul a larger gun if wanted but still the 92`s are light, fast and easier to pack. A couple years ago we were on a group ride. We rode over the mountain range to panguitch which is near Bryce Canyon NP. The group wanted to eat at a popular cowboy BBQ. The place was full of people and I wasn't about to leave my 92 unsecured on my sXs. Wife went in and asked if I could bring it in. No problem. Some college age tourists asked me were we hunting. No, I brought it for all the illegal pot growers. Not a entire lie as some were arrested near there in the woods and I think there were something like a dozen pot farms busted where we ride that summer, every arrest was illegals that probably had to work for the cartel. The busts were published in the paper and on my rides I had been near them all. Many people pack here as this is one of the most popular area for trail riding in the U.S. plus we can open carry and CCL`s are legal and easy to get. I do agree there are a few old model pumps out there that are even lighter and faster but you can find 92 clones, try finding those old remingtons. I do have a 30/06 Remington 760 pump that is fast, accurate and almost as light with a peep but for knocking around I prefer the 92 clones especially in .357. I always pack a revolver too when we ride. Last edited by Booger Bill on Sat Jan 26, 2019 12:48 am, edited 1 time in total. Years ago I had a Staggs Bilt over/under combination gun in .30/30 Win & 20 gauge. If you looked quick at a distance it resembled a win 92 or 94. Most people probably never seen one. It would be good, wish I had kept it. Here is a picture of one. Mossberg 464 with 16 inch barrel makes for a featherweight carbine. Fire Up the Grill - Hunting is NOT Catch & Release! This past summer when we were up north there I had the joy to carry a #2 Model Frank Wesson rifle chambered in the 44 Wesson cartridge. Used 44 Starline 44WCF brass which is near a straight wall case from the factory which worked perfect. With a 200 grain slug cast of range scrap and a near case full f 2F it was a delight to shoot. Our Wesson rifle is the model with no ejector but has bevels cut into the rear barrel face so fired brass can be grabbed at the rim with your fingers. After 3 rounds fired you need a knife edge or (our solution) a brass rod about 10 inches long dropped down the barrel to bump out the fired brass. The brass getting stuck in the chamber is one reason the early Wesson rifles were not popular with troops. What good is a rifle / carbine you can shoot once or twice. But for a woods loafing rifle it is ideal. Ours weights an ounce under 6 pounds and has all the accuracy to pop ground hogs at 50 yards. And a 200 grain soft slug through the shoulders of even a big ground hog ends that critters hole digging future. Not to mention no more bean eating in the field corners. Tanker 71-74 NRA Life Ready to Defend the Constitution from enemies within and without. This is the southern house where legless problems are a major concern along with BIG cats. Normally a Rossi .45 LC for hikes with the dog and a revolver with a shot load when I make the mistake of not watching where I put my feet. This is a photo of part of the northern farm. Where I am not at the top of the food chain and even on the tractor I carry a Co-Pilot in .457 WildWest. and a .22 pistol for the walks back from the field for ptarmigan and grouse. long march . . .
My late Father's 94 Winchester (1956) in 30/30 and a 22 lr revolver. S&W 317 or Ruger Single Six. I know not what the future holds, but I know who holds the future! I’ve got a pair of 527 HB’s one in 6.5 Grendel and the other in 222 REM . I bought both exclusively for paper punching . The Grendel has shown an ability for tiny groups the 222 I’ve not shot enough yet for tiny groups but I think it’ll happen . I have a Leupold 24x on the Grendel and just removed a Leupold 24x from the 222 and replaced it with a Leupold 36x . I do however kinda have a desire for a 527 FS in 222 REM , that might fit the bill s bit better for the OP’s question ! Even with the stubby Little Barrel the Ruger is very accurate, and the threads give the option to suppress it and use subsonics, or the CCI "Quiet", which seems to cycle pretty well in mine. And everybody should have a semi-auto AK as a when nothing else works you go back to the basics firearm. Granted, it's not as basic as a Muzzleloader, but it's kind of like an Uzi, with most Parts being something you could make out of old tractor parts. I think there's a video on YouTube of a guy who makes an AK receiver using a shovel. Did you change your handle? Just saw an AR in 45ACP. Being in Eastern NC, a .22 is fine. In the last few years due to the increase in Nutria, Beaver, feral dogs or the un vaccinated for rabies and often parvovirus carrying uncollared mongrels belonging to the local Hispanics that will attack my dogs, I have started carrying a T-bolt 17 HMR. This forum should be required reading for those considering lever actions. Great post and replies. Thanks to all. My 'woods walking' takes place on 400 acres near Columbus GA and there really are no 4-legged threats to 2-legged prey. We have deer (plenty), armadillo, turkey, beaver, coyotes (heard but not seen yet) and rarely a pack of wild dogs after hunting season. The game processors in the county (Harris) advertise hog processing so I'm sure they are nearby but we are not raising crops and haven't seen any on the property (yet). For years when I walked the property I carried a vintage 1970's walnut stock 10/22 carbine with a Burris Fullfield II scope - total carry weight 6.5 lbs. Then I watched a couple of Hickok45 videos on the Ruger M77 bolt gun in 357 and just had to have one. The only drawback was that Ruger had ceased production about six months before I became aware of them and the used market went through the roof - comparable to JM Marlin's in 357 at about $800-$850. My search for an alternative brought me to the Henry Big Boy steel in 357 for about $660 new (20" / walnut stock / blue finish and 7 pounds. I added another Burris Fullfield II scope bringing the total weight to 7.8 lbs. Nice rifle but with some drawbacks noted below. I recently shot Hornady 158 XTP and 180 XTP hand loads over a chronograph from both rifles. The Ruger mean velocity is slightly (2-12%) higher than the Henry for both bullet weights. Off the bench, I cannot discern an accuracy difference between the rifles using the 158 but the Henry groups a little better than the Ruger with the 180 XTP. Offhand - there is no difference with my shooting but YMMV. So the Ruger has become my 'woods-bumming' rifle because a) it is lighter than either my 10/22 or Henry, b) more weather resistant than either, c) powerful enough to handle any present or foreseeable threats on the property and d) easier to make safe than the Henry. I'll probably use the Henry when hunting from a stand and the 10/22 will likely become that 'rifle leaning in the corner by the back door' once we build on the property. The Ruger on the other hand will probably find a permanent home in whatever ATV or UTV we end up purchasing. I always wanted one of the 77/357's, but I had gotten a 77/44 a number of years ago, and couldn't rationalize such a similar gun. My rationalization skills have gotten better over the years, so now I think I would make the case that the 357 is more able to shoot really light loads than the larger bore 44 . I know the 44 special type loads are light, but nowhere near as light is the 38 special type loads you could shoot from the 357. You are right about the prices on those 77/357's; they keep going up and up. You basically gave a wider useful range for Indiana. My Rossi 92,Trapper is my choice. we used to have a post around here with a video of someone unloading a lever gun by backing the rounds out of the loading gate. it's as fast as running them through the chamber with much less opportunity for a "situation". I unload my guide gun that way. Someone might have a link to that video. Perhaps..
You guys get pretty fancy. Usually a 22. Or maybe an SKS. There's a lot to be said for an SKS in the woods. Although one year I carried a HandiRifle in. 243. Only one shot at a time, but it was as handy as the name implies. hey! good to see you around here! ...proving there is an exception to every rule. I met a girl in Alaska whose sister was in a tent on the North Slope when a Polar Bear came through the tent wall. Girl grabbed the 22 rifle and kilt that bear dead. That does not influence me to leave my heavy for caliber loads in the skiff when I walk b'rer bear's lair. I would not want to rely on a pellet gun, which is what a 22 is . . . know what I mean. You guys are way tougher than I am! When I bum around in the woods any more I'm in my side by side. There is usually a 20gauge OU, along with a Ruger Mark IV. Next trip out though one of the 92's is going.... probably the 357. Glad to see you chime in Danny!